We cracked my skull open and installed a few new parts. Saturday, February 16 I was initiated into Vodou. I feel an obligation to write about my experience, because most people don’t. They say there’s no way to describe it. “You have to experience it for yourself.” But I do believe I can describe some of the feeling, the experience. I wish someone had described it to me long ago. I won’t reveal any of the secret aspects of initiation. There are things the initiates don’t know beforehand, and I won’t share them here. The anthropologists have already revealed them anyway. I won’t give a primer on what Vodou is or what the religion is all about. For a basic introduction read this. Or for a detailed journal of one man’s life in Vodou check out Oungan François’ Chasing the Asson. I cannot help you initiate (sorry). If you are a person considering initiation into a Vodou house, I recommend contacting the wonderful community at La Source Ancienne Peristyle. This does not make me a priest of Vodou. The initiation I went through makes me a “hounsi bosale.” Hounsi is essentially a dedicated member of Vodou. Sometimes I see it used to mean apprentices or assistants of priests. In other usages it seems more like a term for a mystic or devotee who is not clergy. There is no analogous term in Christianity. It’s not like baptism, Christening or confirmation, although I erroneously compared it to those things before I underwent it myself. What is the purpose of this initiation? The reasons are different for every person. In my case it was to dedicate myself to a lwa who I’ve grown very close to. He is my met tet or patron deity. At least, he’s one of them—I have more. For other people, the cleansing aspect of the ceremony might be more important, or being “opened up” as a clearer medium for the lwa. Why did you initiate? It felt appropriate. The lwa have been in my head for over 10 years and finally I’ve had a chance to practice with them formally and learn their traditions, songs, stories. It was time to officially dedicate myself in some way. What about your other religions? I am and will always be a priest of the Old Belief. I practice multiple religions. They’re compatible. Will you become a Vodou priest? We’ll see. I understand why people say they couldn’t possibly describe what initiation is like. However, I do think it can be put in words—you just have to think about the words very hard. Many practitioners have a hard time framing it in a way that outsiders can understand, which is frustrating for both parties. Vodou is primarily experiential. It will provoke moods, emotions, ideas and realizations in the practitioner and that’s really the point. It doesn’t matter what herbs the priest threw into the fire. That’s the stuff that’s easy to describe, but it doesn’t communicate the feeling. Feelings are harder to explain but they’re the end result of Vodou practice. I can’t speak for anyone else’s experience but my own. Other initiates may feel something different. But I believe initiation will always be deep, emotional and outlook-changing. Here is why it can’t be compared to confirmation. Confirmation is as much external as it is internal. The person might feel a sense of spiritual elation or they might feel blasé. Maybe they’re only there because their family expects it. Much of the Confirmation is for the congregation: it shows everyone that this person has made a commitment. It strengthens a social structure. A 14 year old receiving confirmation may feel like the same person before and after; it’s their status with their group that has changed, not their sense of identity. Vodou initiation is internal. Imagine if every person who took confirmation had an immediate vision of Christ bleeding on the cross, then felt the holistic ecstasy of all the angels singing. Imagine they suddenly blacked out and saw through the eyes of Jesus the day he forgave Peter. Vodou has this down to a science. 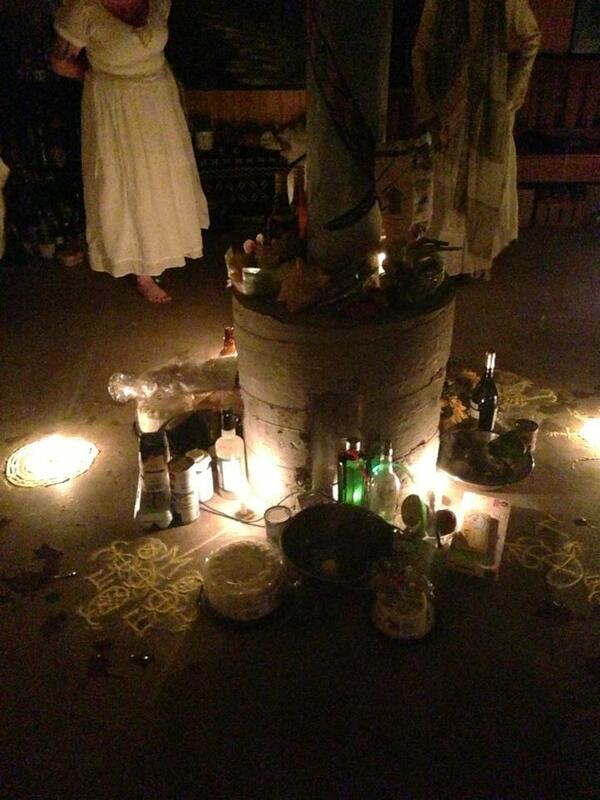 The ceremonies used in Vodou are a finely honed technology that can, reliably, provoke powerful consciousness shifts. No one goes through initiation because it’s “expected” of them. If they’re there it’s a conscious, personal choice to be there. And, in the case of becoming Hounsi Bosale, their status with the group doesn’t really change. It didn’t make me a Vodou priest and it conferred no special powers or rights. I haven’t even made a promise of any kind. The entire point of initiation is to take a step in a personal odyssey. It is a rite of the individual, not of the congregation. Both the expectations and the results of initiation are different than the rites of passage most of us went through growing up. It involves a dramatic internal shift. Four of us initiated together. I had never met the other three. They are part of our House (congregation) but they live in another state. They can’t fly to New Orleans for ceremony very often. I was told to arrive at 6 pm with all my offerings. They looked like they had been there for hours already. I was just showing up for another evening at the temple—something I do every week. For them it must have been a pilgrimage. I wonder how they felt. I’ve been through initiations before. None were quite like the Vodou ceremony, but some were very intense. If we were soldiers waiting to jump out of an airplane, I was one who’d jumped before. It didn’t make this one less intimidating, it just meant I was calm about it. We were sequestered together. I sat leaning against the wall with my eyes closed. I prayed to my oide, Lugh, and reaffirmed my devotion to him. Just because I am taking on a met tet doesn’t mean I don’t need my oide. There’s room in this adventurer for many gods. That was all I really needed to do to prepare. I felt ready for anything. I made small talk with the other initiates, and made sure they were feeling happy and ready. Then I closed my eyes again and waited for my head to break. To a spectator, the highlight of the ceremony is when each initiate personally calls their lwa in. This is something that’s usually done only by the priest. Imagine if at confirmation you were told to turn the wine into blood and you had to find the wherewithal to do it. Would you? Lwa are called in by drawing their veve (diagram) on the ground in cornmeal, giving them offerings and invoking them. There’s a lot more to it but that’s the short version. Each of us had to be our own priest and manage this ourselves. However, for a lot of reasons our lwa were already there. At least for me, mine was in my head since before we entered the main temple and he stayed there all night. I suspect it was the same for the other initiates. The initiation lasts all night. We were aware of this in advance. And yes, we were allowed to sleep. Bear that in mind when you’re reading below. No hallucinogens or drugs are involved at all, not even alcohol. (Alcohol is offered to the spirits, but not consumed.) Bear that in mind below, too. I had a spirit installed in my head that night. What is that like? Overpowering, joyful, profound. It’s overpowering because there is a loss of control. I would move without willing myself to move. At one point I was asked a question and my mouth opened and someone else’s words came out. My lwa’s words. I was conscious and I heard them—I could even have stopped them if I wanted to. But I let them come out, and to hear them in my own voice was startling, almost worrying. It felt like something foreign in my head. Likewise, at times I was completely lost in something. During the ceremony I was grinning and happy and acting with an energy and euphoria that are not part of my everyday persona. While dancing I felt lapses of control over my own body and I felt things very differently than normal. Some of this I had experienced at routine weekly ceremonies. But it was magnified. With time, this overpowering aspect of the experience became normal—I learned to trust it. But even though it began to feel natural, it was no less overpowering. Aspects of my movements, words, thoughts, emotions remained out of my control or, more accurately, external to me. As if I was participating in my actions, but no longer as sole proprietor. The overpowering aspect was there from the beginning, but the joyful aspect set in more gradually. I described already the euphoria during ceremony. This came and went in crescendos. When the main ceremony was over and we were led off for the rest of initiation, the four of us could hardly keep from laughing with excitement. Every one of us was in full contact with something that had previously been glimpsed only fleetingly in prayer. I should note here that one does not choose one’s met tet at random. In some cases, you consult with your priest to decide it. Other times you may just know who it is. But always there is a connection between yourself and the lwa you choose. There are thousands and thousands of lwa, represented most commonly by about 20 main characters that every Vodouisant has heard of. They each correspond to a personality type that us living humans sometimes encounter. Your met tet is often the lwa with the personality most like your own, or the one who inspires you most. In the abstract this is like a list of archetypes. But a list of archetypes does not leap off the altar and into your brain, does not speak out loud, does not dance with you and share your cake. To meet your lwa is like seeing your mother or your soul mate when you thought they were dead. So it’s joyful. But more than just the joy of knowing them, the experience itself is uplifting. All the changes to your body and mind are positive. And my lwa likes the other initiates’ lwa a lot. So the fact that they were there too, also in the flesh, right next to me meant this was like a reunion on top of it all. In my case, the experience included a lot of visions. I don’t mean anything prophetic. But the visions can tell you a lot about what’s happening in your own life, and about yourself. Ultimately this leads to the profound aspect of initiation. The profound comes after the fact. During my visions I was hardly thinking of their meaning at all; I was just in a state of bliss. The next morning, the weight of some of what I had seen, felt or realized crushed home. Again, this will be different for every person. But it comes with clarity. Tremendous, far-ranging clarity. A continued sense of my lwa’s presence in my body, which was welcome. I moved differently. I moved slower, more purposefully and gracefully. I didn’t think about this or affect it. In fact, I noted it with a sort of incredulous awe. I spoke with more confidence, I was more social and charismatic. People reacted warmly to me, even strangers. I made good decisions. I said the right things in conversation, I handled stressful matters easily, and I chose my priorities well. My mind was quiet. Normally I have a lot of thoughts unless I intentionally take them away with meditation. But now I was hardly thinking at all. I paid attention to the moment, experiencing it without judging it. I was more aware of my surroundings. I enjoyed physical sensations more, even simple things like the feel of a blanket. I did better work. I sat down and wrote seven client articles in record time, same quality as normal, but with no distractions along the way. I was able to concentrate fully when I needed to and calmly, easily complete my work. All these conditions lingered long after the ceremony. Some of them are still in effect. I don’t know what the long term effects will be. How many of these conditions will remain? How will they effect my journey? We’ll see. If you have questions about Vodou or the initiation process, please ask in the comments. I’ll try to answer although I’m not a Vodou priest. Note: If you are interested in information regarding Vodou or initiation, I am not the person to ask—I am not a Vodou priest and I cannot speak on behalf of the House or our tradition. Instead, I recommend you contact La Source Ancienne Peristyle. They are great at answering questions. How exhilarating! How do your experiences with your Iwa compare to your relationship with Lugh? Has your initiation in Vodou given you a new perspective on how to proceed with the Old Belief? I have been in a state of total communion with Lugh but it was the result of lengthy, intensive meditation — as in, 5 hours of meditation a day in a week long sequestered meditation retreat after meditating daily for 10 years. In other words, the way I’ve experienced it with the Irish gods is much more like a Vedic approach (controlled experience, practice based) than an African approach (sporadic experience, crisis based). I don’t know if that’s because that is how the Irish gods work, or because the reconstructed practices I used to get there were rooted partly in Hindu practices. I can say that I have also participated in ecstatic, song-dance practices with the Irish deities which they seem to like and respond to. I am definitely pondering whether Lugh would be willing to install the way a lwa is. But for now I am very happy with my current configuration: Lugh is above me and my lwa is in me. It works for all of us. Is there a site you could recommend that lists some of the lwa and goes into more detail about their personalities? I would recommend the book Vodou Visions by my priestess, Sallie Ann Glassman. It’s a solid general introduction with two pages on each of the major lwa including their litany, their veve and an image of them. If you want a list of more academic reading I can pull that together for you, too. I can’t really recommend websites because I haven’t seen any strong ones (not to say they aren’t out there, I just haven’t seen them… though they may not be out there). Congratulations, Drew! I was wondering when we’d hear about all this from you. Glad you’re alright and that New Orleans has been a positive, enlightening and growth experience for you. >But a list of archetypes does not leap off the altar and into your brain, does not speak out loud, does not dance with you and share your cake. Actually, for Jung, it’s this quality – the otherness, the numinosity, the emergence from you-don’t-know-where, and the being taken over – that marks experience of an archetype, as opposed to a rationally-devised symbol or allegory (which is what many seem to think archetypes are). Fair enough! I guess I’d need to be more educated about Jung (a prospect I don’t look forward to). In the common parlance, archetype is frequently used to refer to a powerful symbol and is enmeshed with a lot of practices that, at least in my experience, have not provided this kind of immersive experience. I’d be really interested to hear more about how archetypes have given that dimension of experience for you, and how you use that term – either here if you’re game, or privately if that’s better, BT. >In the common parlance, archetype is frequently used to refer to a powerful symbol and is enmeshed with a lot of practices that, at least in my experience, have not provided this kind of immersive experience. Yeah, I know. That’s probably a major reason why archetypes have lost cred among Pagans – because the popular understanding is, frankly, wrong. Sure. I don’t actually use the term myself, simply because I don’t think Jung has much reliable evidence to support his theories. But as far as his theory goes, it does capture a certain subjective experience quite well, in a way that is perhaps more literary than scientific. I find that in putting myself in the ritual mindset, using sound and posture and chant to facilitate, that dissociative experience starts to come naturally where another part of the mind is able to break into consciousness, appearing as a numinous “other.” And quite often that part of the mind can do things that “I” (the rational conscious ego) can’t, like resolve emotional knots or create a sense of integrated meaningfulness to life. That, to me, is invaluable. This is actually my main problem with it. I’d like to hear more about the numinous “other” that you experience. Perhaps especially because the lwa do not come across as numinous at all (most of them), but as specific beings with rich and individual personalities. Having a lwa in you is less like a transcendental experience of a divine presence and more like sharing your body with a recognizable personage. Does the “other” that you experience have distinct personality traits? If so, do these vary or are they consistent? Does the feeling of this presence (if you’d call it a presence; you referred to it as a “dissociative” experience) linger on after the ceremony? This is amazing ! So precious. I hope it won’t be a problem with your congregation sharing all this. But it is so useful for us. At least me. I work with some Lwas, and I never could understand anything about congregations and initiations. Now I have had a great look into it. Thank you so much. I hope it won’t be a problem with your congregation sharing all this. I should point out that (as noted in the post) nothing secret is revealed here. To be on the safe side, I consulted with a mambo from our House beforehand and she read it and approved. Our main priestess has also given us guidance that it’s fine to talk about the personal/experiential side, as long as we don’t reveal the details of the ceremony itself. Thanks for your kind comments Valiel. Every House is different, but I hope this helps in some small way on your own journey. Most of the lave tet process occurs in private and I’m really not able to describe the methods used. The portion that can be witnessed out in the main temple is very much like a normal Vodou ceremony. The good news is that lave tet is a ceremony that anyone can request to receive. You certainly have a local connection here in New Orleans if you ever want to explore that venue, and other Vodou communities can also offer it to you if you’re so inclined. Where did you go for this? La Source Ancienne hounfo in New Orleans. How long does initiation last? I have been told by some a week..
Also I hear it is crazy expensive is this true? I think it depends a lot. As the initiate, you are responsible for providing a huge number of offerings for the ceremony. This can raise the cost whether you are bringing them yourself or paying a fee so the temple can procure some of them. No matter what you will need to bring rum and some other things when you initiate. In the US this structure has been adapted in different ways by different Houses. For example, at our House the cost of initiation is comparatively low. I can’t give an exact amount because it depends on how many people are initiating – the shared costs are split over more initiates. I would still expect it cost several thousand dollars. Most people save up for years to make it happen. But as our mambo once said to me, “You can find a priest who will initiate anyone for $10,000.” Only those chosen by the lwa are supposed to initiate and you will need to speak to a mambo or houngan beforehand. Hi Kari, thanks for reading :] It depends on which level of initiation. There are three levels of priestly initiation (kanzo, sur pwenn and asogwe). I believe the length of the whole process depends on which level you are doing and yes it can last up to a week. For my initiation, which was just an initiation as a House member and a bosale (free/lay practitioner) the process was all night, taking about 24 hours total plus some additional practices afterward. How can u prettiest vodou? I loved reading this and have always felt connected to voodoo but could never find anyone to guide me. Your experience sounds amazing. I continue to read what I can. Thanks for sharing your journey. You’re welcome Nichole and I’m glad I could help. I really need to talk with someone more knowledgeable about this religion than I am. I am interested in talking to someone that practices because I havent had the chance amd am very interested in learning more please.reply. I would like to get initiated so how do I find places for initiation in Sacramento? I loved reading your experience i am thinking of being initiated as well but honestly im so scared of the spirit possession part! I know alot of the ceremony is kept secret but can you tell me more about that part? I would also like to k kw more about the part you spoke of “putting the spirit in your head” if you can tell me thanks! Nichole, it’s okay to feel that way at first. I think that’s a normal reaction for people not raised in the tradition (which I wasn’t either). Just remember you can ask the spirits not to possess you and the houngan or mambo can also help stop them from entering you if you prefer. However, you will probably want to become comfortable with it before seeking initiation. Just go to some ceremonies or start serving the spirits. Hi I was wondering if it cost and if it’s some priest in the US.? so what do i do if i am in India i have been working with Papa Legba but never been initiated i only work spells what happens now? First of all, thank you for writing your experince. Setting aside the myths and allowing us to share this. I am in the UK and would like to know if you can recommend any houses here. Just found your blog. I’m interested in New Orleans voodou, can you recommend any good books that could help me learn more about the traditions/beliefs/systems of voodou?